Melencolia I is a masterpiece of the German Renaissance artist Albrecht Dürer, one of the greatest printmakers in the history of art. It is an extraordinary tour-de-force in the refined art of engraving and one of Dürer's most renowned and enigmatic works. Considerable debate has focused on the meaning of the massive, winged figure who sits amidst a cacophony of objects and mysterious symbols. 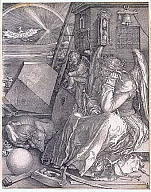 According to the great Dürer scholar Erwin Panofsky, she embodies two previously distinct pictorial types: one of the four human temperaments, the "melancholic," distinguished by her general inactivity and brooding demeanor; and the personification of Geometry, one of the seven Liberal Arts, with all the tools of architecture and carpentry surrounding her. 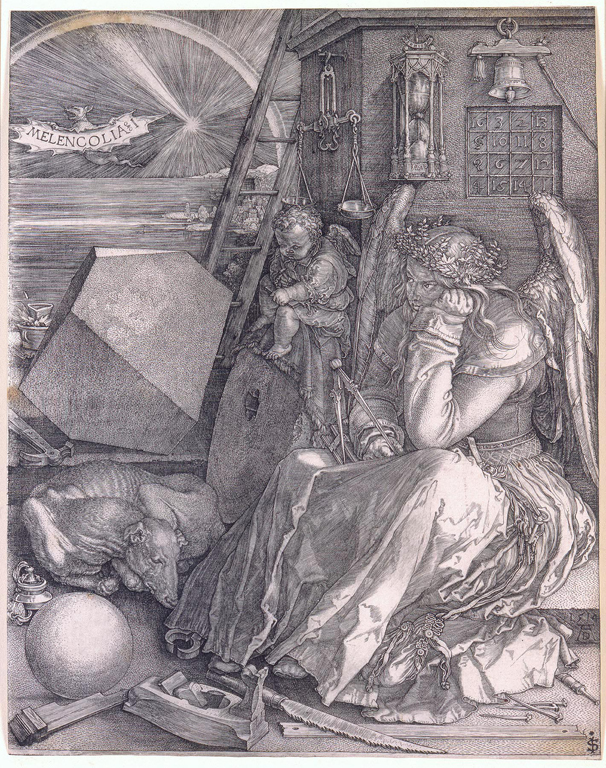 With this combination, Dürer offered a unique vision of the artist-genius, one devoted to the highest ideals of scientific and artistic perfection forever constrained by the limitations of human frailty. As with many other Dürer prints, Melencolia I was reprinted for centuries after the artist's death, producing scores of inferior impressions that show the wear-and-tear of the delicate lines on the original copper plate. Thus, it is important to view early impressions of the print, preferably when Dürer himself was there to ink and print the plate and choose the exact weight and color of the paper. In addition to being a superb impression, the Milwaukee Art Museum's Melencolia I has a unique element in its printing, a subtle wiping of ink left on the garment just below the angel's left knee. This suggests that Dürer was experimenting with this particular impression, trying out a nuance that would give the leg a more voluminous appearance. Once part of the collection of the Earl Spencer of England, this impression therefore is a rare version of one of the most important prints in the history of art. Excerpt from Building A Masterpiece: Milwaukee Art Museum. New York: Hudson Hills Press, 2001, p. 178. Entry by Kristin Makholm. Milwaukee Art Museum. Building a Masterpiece: Milwaukee Art Museum. New York: Hudson Hill Press, 2001, p. 178, color illus. Goldstein, Rosalie, ed. Guide to the Permanent Collection. Milwaukee, Wisconsin: Milwaukee Art Museum, 1986, p. 25, b/w illus. p. 25. Dürer and the German Renaissance, Milwaukee Art Museum, November 24, 2015–March 20, 2016.